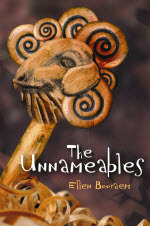 The most tragically overlooked book of 2008: THE UNNAMEABLES, by Ellen Booraem. Reviewed 9/1/08. Which led this blogger to pick it up, and post this review (in part):Don’t overlook this one. To do so is simply Unnameable. But that’s not all! The Horn Book’s list of Newcomers “highlights exceptional work by the latest crop of novice authors and artists,” and features not just The Unnameables, but also Operation Redwood by S. Terrell French! Reviews and press mentions like these are the best examples I can give of the power of writing quality work and trusting that it will find an audience — which isn’t to say that Ellen or Susannah have been resting on their laurels since their books’ publications! It’s about keeping a presence on the internet, working with your publisher to continue to promote your books, and basically doing everything you can to be sure your book is in front of the people that matter. If you’re committed to being an author, you need to know it’s a long-term commitment, not a flash in the pan gig. Are you ready for that? Can you keep up what you’ve been doing to promote yourself and your work for the next five years? The next ten? That is such good news about THE UNNAMEABLES! And I think Kirkus has it right: the most *tragically* overlooked book. It is such a clever concept and story, I can't believe it didn't garner more attention. But at least that's being remedied now! The Unnameables deserves all the praise it can get! And congrats all around for the Horn Book mentions!